'Awvea Sätswayonit alu TORUK livang, ulte rivun Tsyeymzì Kämeronä Uniltìrantokx lu tsim tseyä a vurit a lu ngrr mipa säwìntxuä a ta Cirque du Soleil. 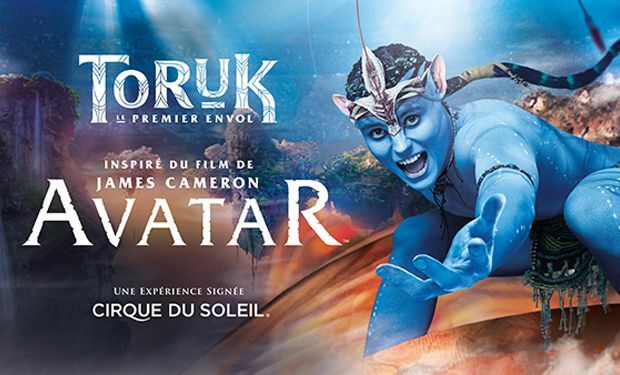 Explore “TORUK—The First Flight,” and discover the story, the source of which is James Cameron’s AVATAR, that is the root of the new show from Cirque du Soleil. Re-posting my thoughts from Facebook more or less. This has the potential to do some really interesting world building. I love Cirque du Soleil shows and most of them sort of follow "a story in a story in a story" plots. I can see this being done as a sort of around the fire at night story being told by a clan show. It really has the potential for some amazing world building as well. We only really got a passing mention to the Na'vi story telling culture, so this can be used to develop that. Cirque also has a really proud clown heritage, so maybe we'll see some of that come in. For some reason the thought of a more comedic troop of Na'vi really intrigues me. What do they consider "funny" or "clownlike"? If the show approaches this right, it could create some really expand the universe of Pandora in a unique way the movies simply cannot. So this is "inspired by James Cameron's AVATAR"...I wonder, how closely has he worked with the show's creators on this? Will this be the first new bit of canon story to come out since the movie? EDIT: Never mind, I think James Horner has already answered my question in this video. Last edited by Empty Glass; 04-29-2015 at 09:20 AM. Over the yrs I've seen 2 Cirque shows (both in Vegas), and they were great! So I can't wait to see this new Cirque show, esp since I think Avatar and Cirque du Soleil will make for an interesting combo. And...potential for fan meetup(s) at performances! Sounds enchanting. I need to see this with the rest of the clan. I can imagine it being an amazing experience. Well, I just bought my tickets for Sunday December 27th in Montreal! Can't wait to see it. Last summer, I went to see Cirque du Soleil (Kurios) and it was fantastic, so here's hoping it'll be as good (or better) than that show. I discovered this recently...if you go to the main Cirque Toruk page (www.cirquedusoleil.com/toruk) and scroll down a little to where it says "Enter Pandora", it's like a cool scavenger hunt type thing where you scroll/pan through all these different and beautiful Pandoran landscapes and find hidden objects pertaining to 5 Na'vi clans (including the Omaticaya) and learn about those clans as you go along. The 4 other clans are all new to me so it was interesting to learn about them, and I bet they will probably be featured somehow in the Cirque show itself. There's also a contest/sweepstakes you can enter to win a "Behind the Scenes" experience at a Cirque Toruk show (so of course I entered it). And...scroll further down on the main Toruk page to where it says "Inside the Creators' Studios" to watch videos with the show creators and the puppet designer. You'll also be able to see concept art/drawings of some of the animal/creature puppets that'll appear in the show -- very cool! I'm contemplating going to the one in Rhode Island next year. It may be a bit too far away for me though. Tbh, I've never been to Rhode Island, and I'm not too sure how to get there from here.